In most people’s minds the mention of Cheap Flights To Kimberley brings visions of sparkling diamonds and an enormous hole but visitors are pleasantly surprised with its wealth of history besides mining. In semi-desert terrain, Kimberley is capital to the Northern Cape Province. Accommodation comprises a variety of 3-Star B&Bs, guest houses and the historically renowned 4-Star Kimberley Club boutique hotel. Founded in 1881, it accommodated royalty, Governors and high commissioners with Cecil Rhodes and Ernest and Harry Oppenheimer being past members. R7 buys you a ticket on the only working tram in the country to the Kimberley Mine Museum, adjacent to the Big Hole. 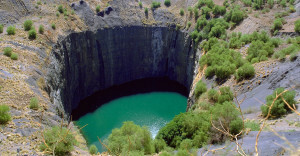 Experience an edifying guided tour on Kimberley’s diamond history and gaze down in awe at the green murky waters of the Big Hole from a viewing platform. The ‘Old Mining Town’ has 40 original and model buildings complete with shops, offices and items dating back to the early days of Kimberley. The Africana Library provides a wealth of information in archive material related to the diamond industry, missionary work and SeTswana books. Two of its most renowned books are the 1829 copy of Dr Moffat’s translation of the Old Testament into SeTswana, the first Bible printed in Africa and a 1st edition of Schedel’s 1493 Nuremburg Chronicle. The McGregor Museum includes two rooms from the original house that Rhodes built with interiors as they were when Rhodes lived there. Art connoisseurs will especially appreciate the William Humphreys Art Gallery that is home to superb examples of 16th and 17th century art by Dutch, English and French masters. Drawing much interest is a remarkable rock engravings collection that traces ancient San engravings far back to 12,000 BC, with photos and examples. To the east of Kimberley is Belgravia, where many wealthy miners built their grand Victorian homes. A two kilometre historical walk takes you through the area with stops into ‘Rudd House’ and ‘Dunluce’, both national monuments. Belgravia is home to the ‘Duggan-Cronin Gallery’ that has an impressive collection of 8000 ethnographic photographs taken by Alfred Martin Duggan-Cronin between the years 1919 and 1939. Aeroplane enthusiasts should visit the ‘Pioneers of Aviation Museum’ situated on the site of the first flying school in South Africa, established in 1913. Five kilometres out of Kimberley is Kamfers Dam, a natural heritage site imperative for the Lesser Flamingo, the smallest of the flamingo family with colours less vivid than the Caribbean flamingo. These stunning birds can be seen in numbers of up to 60,000, a sight never to be forgotten. As this breeding site is sadly in trouble, ‘Save the Flamingo’ was set up in attempts to save and preserve these precious birds. The Magersfontein Battlefield Museum covers one of the most famous battles of the ‘Anglo-Boer War’ with memorials, crosses and historical data. By comparing over 2 million flights to Kimberley we are able to show you in the table below, some of the amazing prices on offer on our sight for cheap flights to Kimberley during the year. These are actual flights booked by our customers with flights from Johannesburg to Kimberley, flights from cape town to Kimberley and flights from Durban to Kimberley being some of the most popular routes. The best way to travel around Kimberley is in a reliable hired vehicle. When flying into Kimberley Airport you have right there for your convenience, ‘Avis’, ‘Budget’, ‘Hertz’, ‘Imperial’ or ‘Tempest’ car hire, which is your best bet to avoid missing your return flight as there is no shuttle service to or from the airport. Alternatively you can hire a private taxi. Kimberley’s railway station is close to the city centre with regular stops from the luxurious ‘Blue Train’ and ‘Rovos Rail’ on their way to Gauteng. Kimberley, the City that Sparkles is virtually located in the heart of South Africa, right on the eastern edge of the Northern Cape Province, the country’s largest but least populated of all nine provinces. Comprising a continental climate, Kimberley has hot wet summers from December to February with mild dry winters from June to August with winter nights often dropping to below freezing. From December to March, Kimberley’s hot summers can be uncomfortable for some with afternoon temperatures between 33 to 36°C, sometimes reaching 40°C. Autumn months of March and April are enjoyable while the winter months of May, June and July are bitterly cold but with some warmish days. The cooler spring months of August and September are more pleasant for flights to Kimberley than the summer heat. July to November has the flower population in certain sections of the Northern Cape emerging in breathtakingly bright colourful displays. The city is a prime tourist destination that offers visitors, besides diamonds and its Big Hole, a wealth of interesting history in museums, art galleries, the popular Belgravia Historical Walk, ancient San engravings and loads more. It also serves as a gateway for tourists venturing out to nature reserves and big game farms. To get the best deals on flights to Kimberley, plan early and receive daily updates with the latest airfares and specials available for domestic flights in South Africa. Make even further savings by booking a combination of flights, car hire and hotel. Domestic Flights South Africa do all the ground work, all you need do is register to receive your daily cheap flights up-date, provided free of charge. The summer months will see flights to Kimberley increase in demand and will ensure that cheap flights to Kimberley are few and far between. If you are looking for mango flights from Kimberley to Johannesburg it might be worth your while looking out of season as this is when flights from Kimberley are in less demand. Flights to Kimberley from Cape Town also increase in demand and cost during this period. Shuttle services available from Kimberley Airport for passengers not being collected include Rikki’s taxi (083 342 2533), Peter J (084 528 8380/072 286 0653) and Black Rose Taxis (076 327 6988). Passengers that haven’t combined their car hire vehicle with their cheap domestic flight can hire a car at the airport from Avis, Bidvest, First, Hertz and Europcar, a necessity to travel further afield from the city. Save yourself time and stress by allowing Domestic Flights South Africa to book your cheap flight along with your favourite car rental company.